When I finished this Zentangle Inspired Art (ZIA) piece it reminded me of a secret garden. Apart from the wide border the string was a couple of lines which turned out to be the branch, everything else grew from there. Tha paper colour is called vanilla. I'm running out of superlatives!! As of today... this is my favorite. But I'm just waiting for the next one, which always surpasses the previous one! 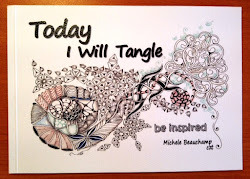 Outstanding design with the uncurling spirals spilling their "petals". Your border/frame is truly delightful. An idea....have you ever done an Asian inspired piece? Good idea Ruthie, I haven't tried any thing Asian but Paul and I are going to Vietnam in July, the sights will be very inspiring! I've only recently discovered the zentangle and it's beauty!! Your piece is stunning! I can't seem to stop looking at it!! 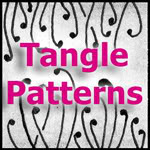 Have fun with all the ideas floating about the Zentangle sites Cathy, we love to share! WOW!!!! So inspiring! Thanks for sharing! I don't know what to say...you're just the best!!! You are so very kind Dianne! it is a wonderful work of art! I'm new to Zentangle, it's amazing to see what can be done. I was new once too Nancie, it's true anything is possible one stroke at a time. Have fun! How beautiful, you have so many different patterns and it all goes together perfectly. I still haven't tried a large piece, yours is very inspiring. Thank you all so very much for your super generous comments. I'm planning to make a big size ZIA for a long time. This work inspires me to start one soon. Once again, absolutely awesome! So inspiring. 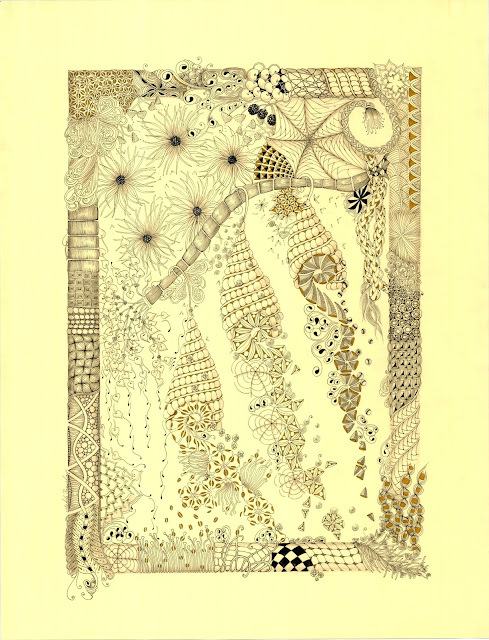 I am new to Zentangle, I can only aspire to be this good some day. Secret Garden suits the Tangle to a "T". This piece is simply stunning. I would love to see it matted and framed. oh my, michele, this is gorgeous! i keep trying to do large scale, so i'm glad to have found this tutorial. i love your work! simply, AWESOME! i love the large scale. I have thought about a large scale drawing myself, i'm inspired. Thanks for sharing your work.